ST. PAUL, Minnesota, February 8, 2013 (ENS) – Moose in Minnesota are dying and the reasons are a mystery to state wildlife officials. The Minnesota Department of Natural Resources says since 2010, the moose population has declined 52 percent. A newly completed aerial survey of moose in northeastern Minnesota indicates the rate of population decline has accelerated and moose numbers in the region are down 35 percent from last year. In response, the DNR will not open a 2013 state moose hunting season or consider opening future seasons unless the population recovers. “The state’s moose population has been in decline for years but never at the precipitous rate documented this winter,” said DNR Commissioner Tom Landwehr. “It’s now prudent to control every source of mortality we can as we seek to understand causes of population decline,” said Landwehr, explaining the rationale for closing the season. To help find out why moose are rapidly dying, the DNR is leading the largest and most high-tech multi-partner moose research effort ever initiated. Using funding from the Environmental and Natural Resources Trust Fund, the $1.2 million project is using the latest technology and an unprecedented amount of DNR staff to learn more about the moose mortality. Starting in January, wildlife researchers began fitting 100 moose in northeastern Minnesota with GPS tracking and data collection collars. 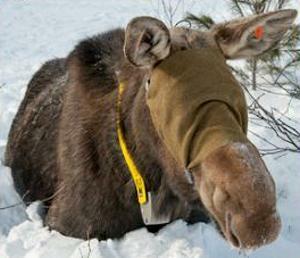 To date, 92 collars have been placed on moose in the Grand Marais, Ely and Two Harbors areas. This multi-year research project will investigate the causes of adult moose mortality, calf mortality, calf survival, moose use of existing habitat and habitat quality. 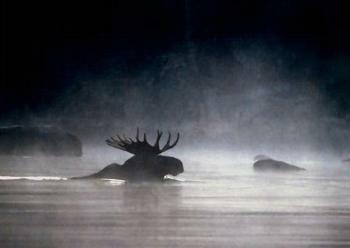 Rolf Peterson, a research professor at Michigan Technological University is renowned for his study of the wolf-moose relationship on Lake Superior’s Isle Royale and chaired the DNR’s former moose advisory committee. Peterson agrees with the DNR’s decision to conduct pioneering research and discontinue hunting until more is known. “The DNR’s decision to suspend hunting makes sense given the disturbing and abrupt decline in moose numbers,” Peterson said. The DNR has conducted aerial moose population surveys in northeastern Minnesota since 1960. The survey involves flying transects in 49 randomly selected plots spread across the Arrowhead region of Minnesota. The Fond du Lac Band of Lake Superior Chippewa and 1854 Treaty Authority contributed funding and provided personnel for the annual survey.